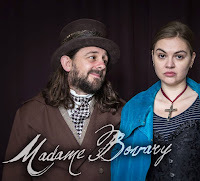 Rosanna Lowe's version of Gustave Flaubert's Madame Bovary was originally commissioned by Simon Godwin for the Northampton Royal Theatre, so it perhaps seems apt, that it returns to a stage of the same town, in this new wacky interpretation from Masque Theatre. Masque's publicity for the show, describes it as a "madcap tragedy", and for those more familiar with Flaubert's novel you shall perhaps be a little surprised by the anarchic version created here. This is tragedy played for full-on slapstick effect, and while at times it might seem overwhelming in its intensity, the ride we are taken on is a delight. 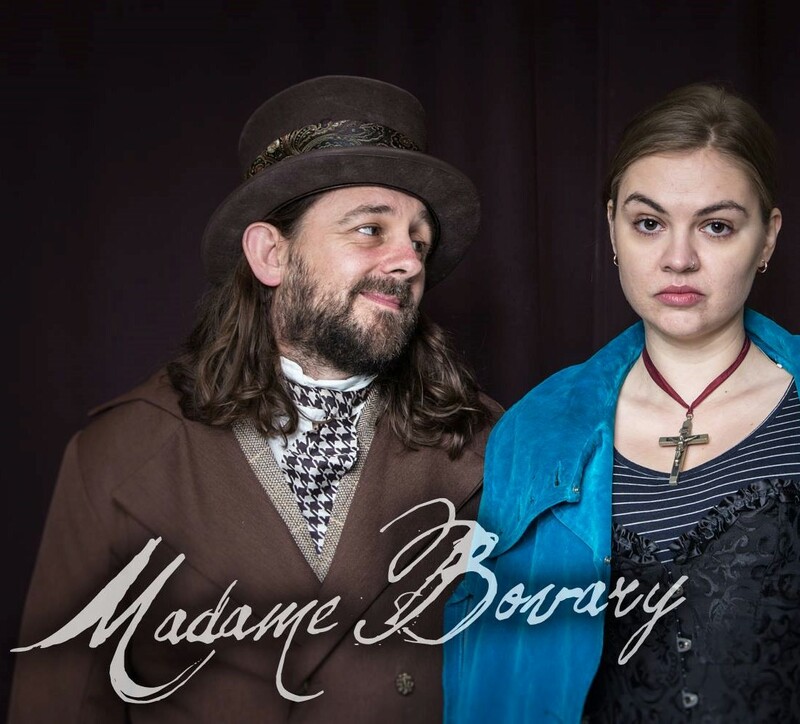 Directed by Tamsyn Payne and Alex Rex and a team of talented creatives, Madame Bovary's props and design are every bit as important as the talented cast wielding them. For an amateur production, the attention to detail is nothing short of staggering. Gloriously created books filled with delights, puppet dogs and children, mini nuns, and little baskets of apples, are among many of the props that make this show more than the sum of its performers. However, this show also revels of course in the skills of the four (and a sneaky fifth, with Alex Rex appearing in a few roles) actors, headed by Julia Langley as Madame Bovary. Whenever Langley is on stage, you always feel that the audience is in for a treat, and as Emma Bovary, here there is no difference. Revelling in the depth and complexity of the character, made more so in a comic version, Langley brings the mischief and naughtiness of the character to life. However, also well prepared for the turn of events at the end, because even as a wacky version of the story, this does not shy from the power of its tragic end, and Langley as ever has the skill to take the craziness down a significant notch, to bring Emma Bovary back to the complete Flaubert original in those dying embers of the play. While Langley has the single role of Emma, the remainder of the cast in this production bring to life numerous characters from the original. A newcomer to Masque, Lou Chawner may well concentrate his performance on the vital role of Charles Bovary, which he brings to life in a surprisingly subtle way. However, in Madame Bovary, his perhaps best role is that of the oily Lheureux though, apart from looking the part, he captures the character very well. Chawner also, like a professional, handles the issue of a broken foot, performing the play entirely on crutches. Another newcomer to Masque is Mairead Kearins, who also has a collection of random characters, and more especially the first of two performers which are gender switched, as the bulk of Kearins characters are male. So, not to put my foot in it too much, it has to be said that Keirins creates the roles well, perhaps the best of which is that of Leon. Also taking on the baton of being rather manly, is the brilliant Beverly Webster. She creates each of the characters with her usual ease and manages to act beyond that significant moustache, to make Rodolphe her best character. There is no question that the energetic, and brilliantly created scene of her romping with Madame Bovary in all manner of positions is the best of the play. Technically, this is a very successful affair. There are more than a few neat ideas dotted around, with a lovely little twinkling sky, cascading notes from above cleverly rigged, and a simple, but well created fireworks display. There is clearly more than a little blood, sweat and tears gone into this production, and every moment of that shows on the stage. I am loath to say that at times Madame Bovary is simply too creative, as that is a crazy thing to say, but possibly one of the few criticisms I can level at it, is that is occasionally too busy, and you often feel you are missing out on some other ingenious idead. Once you get on the wavelength of the show, however, which probably takes a few minutes, Madame Bovary is tremendously entertaining and benefits from a lively, sprightly (yes, even on crutches) cast, with two particularly strong performances from Langley and Webster. Despite all the chaos throughout, it all ends as it should from this tale, with a truly poignant scene, excellently created. A romp of a night at the theatre. Performance reviewed: Tuesday 10th April 2018 at the Playhouse Theatre, Northampton. Madame Bovary runs until Saturday 14th April 2018 at the Playhouse Theatre, Northampton.